Though undoubtedly one of most important Hungarian musicians after the Second World War, and counted among the great violinists of the fifties and early sixties, Johanna Martzy�s star would soon fade from international memory and increasingly become a name known only to connoisseurs. Even shorter than her international concert career � her final public concert took place in 1976 � was her career as a recording artist. Her first recordings were made at the beginning of the 1950s, with Deutsche Grammophon, and then in 1954 the 29 year old was signed exclusively to EMI. 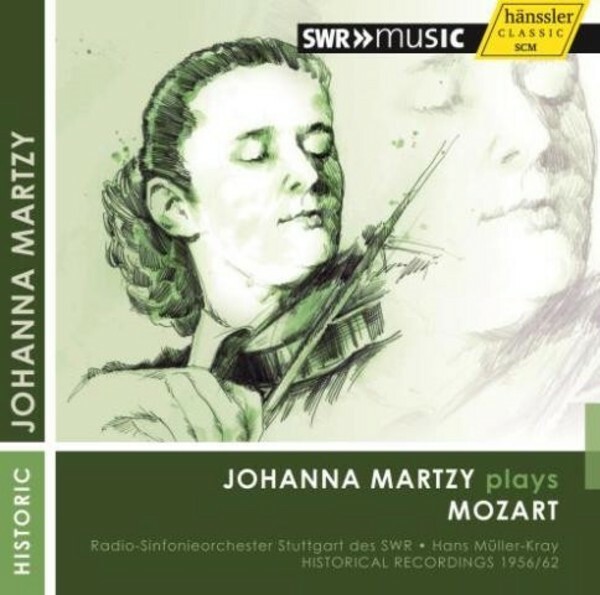 All of Johanna Martzy�s recordings were taken off the market a few years after their release, which gave her a near legendary mystique and a very committed following of collectors. An EMI recording of Mozart's G Major Concerto was never published. Mozart's D Major Concerto, K.218 was recorded with Eugen Jochum in the early 50s. In the present recording, the D Major Concerto, K.218 (from 1956), and the G Major Concerto (from 1962) were made as a live recordings of a studio production. Johanna Martzy�s Mozart displays not only technical perfection and a gloriously unfolding tone, but also consummate mastery of the bow in all its nuances, and a cultivated passion of expression.